Are you looking for the best private Island resort? Philippines is rich in natural resources including the beautiful beaches and resorts that surely you'll be likely to come back. I'm sure you know already those famous beach and resort in the country but I'm sure that Ariara Island in Palawan is new from your ear. 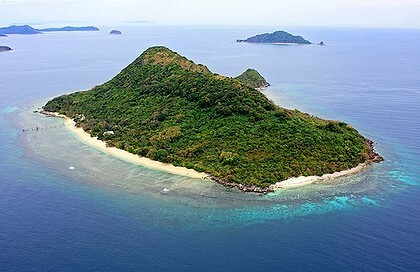 The Island in Calamian, Palawan known to be "Ariara Island" ranked first in the Top 100 holiday destinations list of the Vogue magazine in British edition. This is the island that we Filipino must be proud of, with its 600-meter white sand beach and very beautiful views of the sea. Department of Tourism said in a statement, "What is remarkable is that the entire resort is a testament to the unique artistry and skills of Filipino designers and artisans. The use of local materials and traditional techniques serves as good advertising for Filipino craftsmanship and world-class products. Tourism is not just about counting tourist arrivals. More importantly, it is about building opportunities on the ground and improving lives, in communities in very real places." Ariara Island was hailed by other UK magazines as one of the world’s best islands. Like Times Magazine, which called Ariara the "Best Private Island Resort." Some magazine listed Ariara Island in the "2012’s Most Surprising Holiday Destinations," as one of the best islands to visit this year. Ariara Island is located 160-miles southwest of Manila and with EXCLUSIVE private use of the whole property for you and your guests. Meanwhile, DOT revealed that UK still remains top tourist generator of the country, with 104,466 visitors recorded last year 2011. If you want to know more about the Ariara Island, just visit their website. Comments or suggestions about "Ariara Island in Palawan as one the World’s Best Islands" is important to us, you may share it by using the comment box below.